Experts are worried about India, Pakistan and North Korea. Welcome to Bayesian Update, an attempt to take a step back and figure out what’s changed in the world since before President Trump was elected. In each piece, I’ll pose a high-stakes question with a numerical answer and ask a panel of experts to give their estimates and describe recent trends. The trouble is, nuclear risks are hard to measure quantitatively. The small sample size (two bombs dropped, ever) and rapidly changing technological and diplomatic contexts don’t exactly lend themselves to simple mathematical modeling. While such models do exist, they are “mainly an exercise in structuring one’s thinking, not something that would provide a ‘right’ answer,” according to Matthew Bunn, a professor at the Harvard Kennedy School. But just because we can’t model our way to an exact answer doesn’t mean we should throw up our hands and move on. Since so many lives are at stake, even a tiny increase in the probability that nuclear weapons will be used is a really big deal, and that remains true even if our best predictions are somewhat imprecise. Academics and diplomats who spend their careers studying nuclear weapons have a pretty good conception of the nature and magnitude of the risks — their back-of-the-envelope estimates are as good an answer as we have. And while some experts disagreed on the details, everyone I spoke to painted the same general picture. 2 a terrorist organization could acquire nuclear weapons capabilities. The conflict that topped experts’ list of clashes to be concerned about is India-Pakistan. 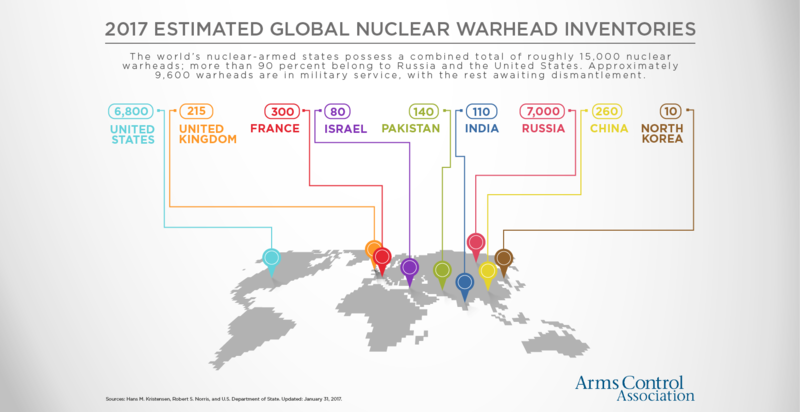 Both states have developed nuclear weapons outside the jurisdiction of the Non-Proliferation Treaty, both states have limited capabilities, which may incentivize early use, and bothstates — though their public doctrines are intentionallyambiguous — are known to have contingency plans involving nuclear first strikes against military targets. Similarly, just because there’s never been a nuclear terrorist attack doesn’t mean that it will never happen. In theory, if a non-state actor got ahold of enough fissile material — the active ingredient in nuclear weapons — it would be relatively easy for them to assemble and detonate a bomb, according to Robert Rosner, former chief scientist and laboratory director at Argonne National Laboratory. “You’d need some physicists who know what they’re doing,” Rosner said. “But based on what’s available in the public literature, you could go ahead and make a uranium bomb.”1 Detection and prevention at this point would be very difficult, Rosner says — a weapon could be assembled in a garage and smuggled in a standard box truck. Fortunately, fissile material is hard to come by. The processes used by states to develop fissile material — a diffusion plant or farm of specialized centrifuges for enriched uranium, a specialized reactor for plutonium-239 — would be prohibitively expensive for a non-state actor. Plus, due to their size (dozens of acres), these facilities are highly conspicuous and would likely be identified and destroyed before a terrorist cell could refine enough material to pose a threat. A terrorist with nuclear ambitions, then, would have to acquire existing fissile material from one of the nine nuclear states, which could happen in one of two ways. First, there’s open theft, either of fissile material or of a fully assembled weapon. This would likely require a firefight, according to Rosner — nuclear facilities have armed guards2 — which would alert authorities to the presence of a threat. Second, which is the likelier possibility according to several of the experts I talked to, is through the assistance of an insider: A double agent with terrorist sympathies could infiltrate a state’s nuclear apparatus and simply deliver a weapon to a non-state actor. When you imagine state use, though, don’t think of a red-faced Trump or Kim launching a petty revenge strike. “Nobody’s going to wake up one morning and say, ‘Gee, today would be a really great day for a nuclear war,’” Bunn said. These scenarios account for a tiny sliver of the probability that nuclear weapons will be launched at civilian targets. Humanity’s best recourse, if we (prudently) assume that accidents are inevitable, is to back away from the edge of the cliff until we can afford a stumble or two without falling off. But we have not done this — quite the opposite. The experts I spoke to pinpointed three interlocking trends that they believe have brought us closer to the brink than we were in 2015. Opinions vary on the domestic merits of this political shift, but the experts I spoke to were unanimous in condemning this strain of anti-globalism and anti-multilateralism from the perspective of nuclear security. The main concern is that nationalist governments might “take measures to increase their survivability in ways that would not be particularly conducive to global security,” said Narang. “There is a reassessment of the security politics,” said Angela Kane, former high representative for disarmament affairs at the United Nations. “When you look at [the election of President Trump], particularly coupled with the Brexit decision last year,” and the growing electoral strength of far-right parties “in the Netherlands, France, Germany — all of this brings an instability into the situation that people are greatly worried about.” International peace, after all, rests on a number of treaties and assumptions that are now being called into question. “We’ve seen this movie before,” said Narang. “The Eisenhower administration went to tremendous lengths to establish essentially nuclear sharing agreements with [West] Germany … to stop them from getting the weapons … so that we and we alone could control nuclear use and escalation.” Removing the nuclear umbrella and encouraging allies to go it alone can only complicate the picture. “The more countries that have nuclear weapons, the more nuclear weapons there are in the system, the more actors have the ability to use them … the probability of use just accumulates,” he said. The third trend is, in the context of nuclear weapon use, perhaps the most significant: “The disarmament process has come to a halt,” said Rajaraman. The assertion that the U.S. will not renew the New START treaty, a bilateral agreement that limits Russian and American stockpiles; the pending review of the 2015 deal that curbs Iran’s production of fissile material; Trump’s signals to other nuclear powers that the U.S. intends to expand and modernize its arsenal3 — this is not just talk. These are concrete actions that work directly against the program of nuclear disarmament, which has been progressing in fits and starts since the end of the Cold War.